MADISON, Wisc. – When life gives you lemons, you make lemonade. And, if you’re USL League One club Forward Madison FC, when it gives you a giant snowstorm, you make the sort of viral social content that will immediately put your newly-formed club on the map. Accompanying Klein on his excursion were some of the plastic flamingos that lie randomly around FMFC’s offices, which proved the inspiration for his idea. 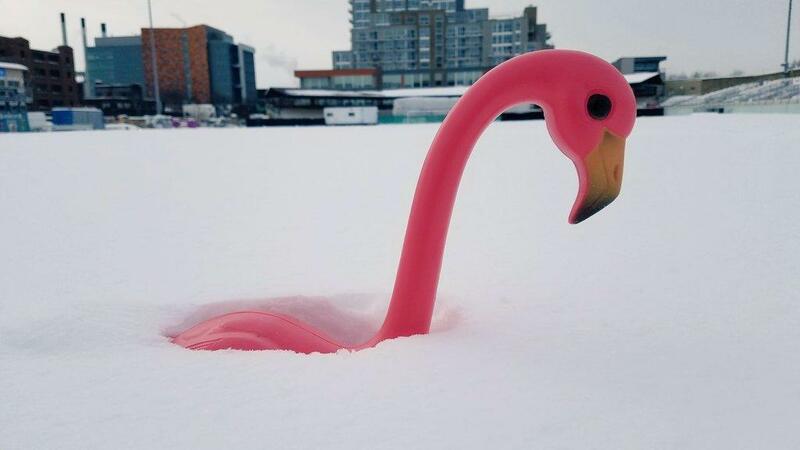 Planting one of the flamingos in the snow, Klein began taking photos each day that humorously showed how heavy the snowfall had been. As the club started posting the images to its social media accounts, its fans took over. And so, a new club hashtag was born. 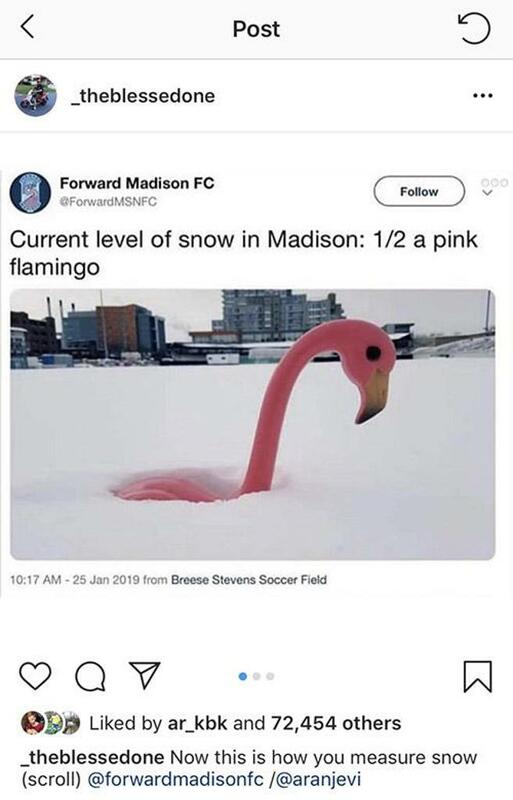 Instagram's @_TheBlessedOne sent out Madison Forward FC's A Madison Snow Story to 1.5 million followers, expanding its worldwide reach. 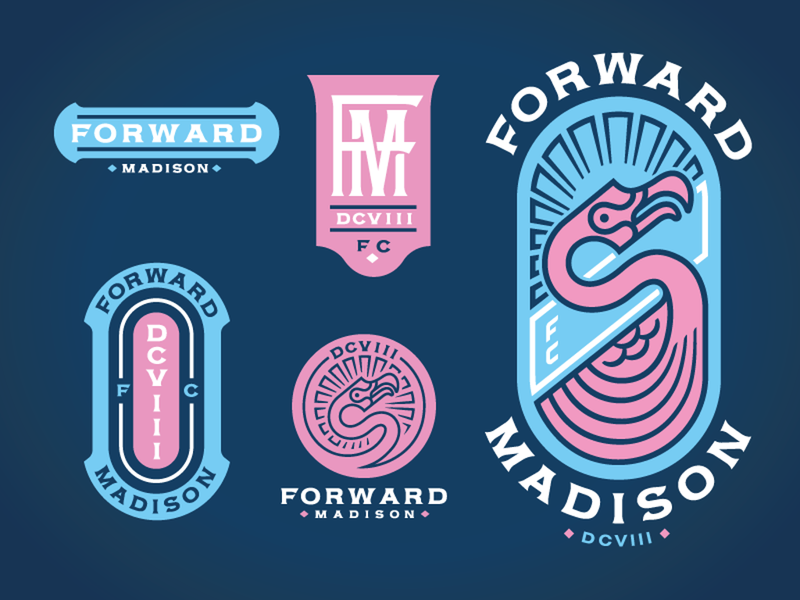 But the story, while great in of itself, also epitomizes the spirit by which Forward Madison has quickly become embraced both locally and nationally, collaborating with supporters on key decisions as the club has ramped up for its first year in USL League One. In the middle of those efforts has been Managing Director Peter Wilt, whose successes in connecting with fanbases at the launch of the Chicago Fire in Major League Soccer and current USL Championship side Indy Eleven provided a blueprint for FMFC’s launch. “Every club he’s been at, a lot of his success has been reaching out to fans and making them part of the process and being transparent, and we just continued that tradition here in Madison,” Krzyzostaniak said. “The leaders of our supporters group here, The Flock, they were part of the brand building from the very beginning. We had two of the guys in for our strategy sessions when we first launched, and I don’t think too many clubs would have done that. We were showing them early designs for what the logo was, and they really pushed us to what the final product ended up being. Krzyzostaniak himself has been in the middle of successful campaign launches and creative storytelling in the past, working for KickTV and being a key player when the Bundesliga pushed to accelerate its English-language content and reach in the United States. He points to the success clubs like Bayern Munich and Bayer Leverkusen have had with their English social media accounts in creating an image that people want to interact with and enjoy as one of the models Madison has used in its social strategy. There’s certainly nothing bland about anything Forward Madison has done in preparing its fans for what’s ahead in its inaugural season. From feature stories on the club’s website introducing the personal stories of its players to funny and clever social media storytelling, FMFC has developed a following that has spread throughout the North American soccer community, and even overseas. ... while also having fun with an unconventional reveal of the meanings behind the elements. Achieving that level of visibility in just three months after its branding launch last November has put the club firmly on the map and has its newly-won followers waiting to see what’s next. With a kit launch coming soon, and its inaugural home opener on April 27 at Breese Stevens Field against Greenville Triumph SC, FMFC believes it’s just getting started on what it can become.